Royal Mail has partnered with Small Business Advice Week to champion exporting as one of the key ways for the UK economy to grow moving into 2019 and beyond. UK SMEs have made significant inroads to increase their exports since 2016, according to new research from Royal Mail released today to support Small Business Advice Week. Over half (52 per cent) of UK SMEs sell to customers outside the UK, up from 40 per cent in 2016. However, this means that just under half of UK SMEs are limiting growth opportunities by continuing to focus on domestic sales alone. Cost and complexity of getting through customs (34 per cent), knowledge of the market (20 per cent) and risk associated with currency conversion (19 per cent) are some of the factors putting off UK SMEs selling to customers outside of the UK. Europe is currently the most popular region for UK SME exports. A quarter (25 per cent) of these businesses already sell within the EU and would like to seek opportunities to sell outside the EU. Thirteen per cent already sell outside the EU and will be seeking more opportunities to do so. Over the next five years, UK SMEs would like to export 20 per cent of their goods. ​While domestic online marketplaces are popular among SMEs looking to grow their UK customer base, only four in ten (37 per cent) sell products on international marketplaces. While this represents a 60 per cent increase from 2016, the figures suggest that many are missing out on the huge sales potential such marketplaces offer. Exporting UK SMEs expect almost a fifth (17 per cent) of their sales to come from outside the UK this Christmas. This peak sales period is increasingly viewed as an opportunity to drive further growth through international sales, as well as to take advantage of changes in currency rates. ​Retailers should offer affordable delivery to overseas customers, otherwise they won’t buy. The cost of carriage should not exceed one third of the price of the goods and free delivery is an attractive option for many customers, if it makes sense. Most non-EU shoppers are concerned about customs charges – many websites have intimidating warnings, suggesting that customs charges can often be prohibitive. However, sales within the EU incur no customs charges at present. Most international buyers use MasterCard or Visa and Maestro is becoming increasingly popular. Also consider offering Paypal. If you have identified a target market overseas that is non-English speaking, then translate your website and make sure it is searchable in the target language. Create a simple to use tool that will translate your prices into euros, dollars or the currency of your target markets. It is important to offer some degree of support in the local language. Offer an email, phone number or live chat support and remember to consider time differences. Make sure you understand the local pricing structures, service expectations and nuances of your target country. Wherever you want to send a letter or a parcel, at Royal Mail we can deliver. Our outlook and our networks are international. We provide letter and parcel services to and from countries around the world and have established global reach with all postal authorities. ​Royal Mail has helped many businesses to sell overseas, including Biscuiteers. Royal Mail enables the company to sell handmade biscuits, chocolates and macaroons all over the world. You can find more information here. 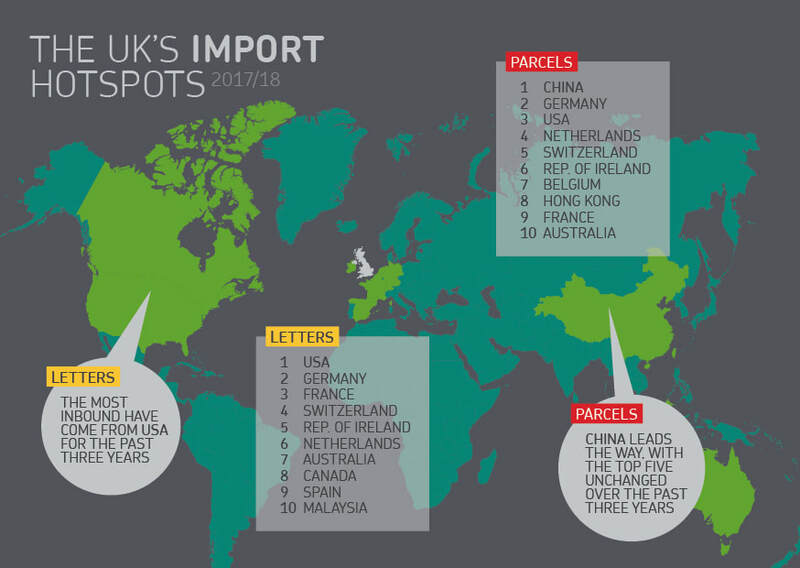 The USA, the largest economy in the world*, is the UK’s top exporting hotspot for business parcels, according to Royal Mail data for the financial year 2017/18. France and Germany take the second and third spots, respectively. Australia takes fourth and Ireland fifth place. The USA has been the UK’s top exporting hotspot for the last four years. France and Germany have also featured in the top five for UK business parcels over this time period. With global reach and the leading enabler of ecommerce in the UK, Royal Mail is well placed to observe trends across the industry. 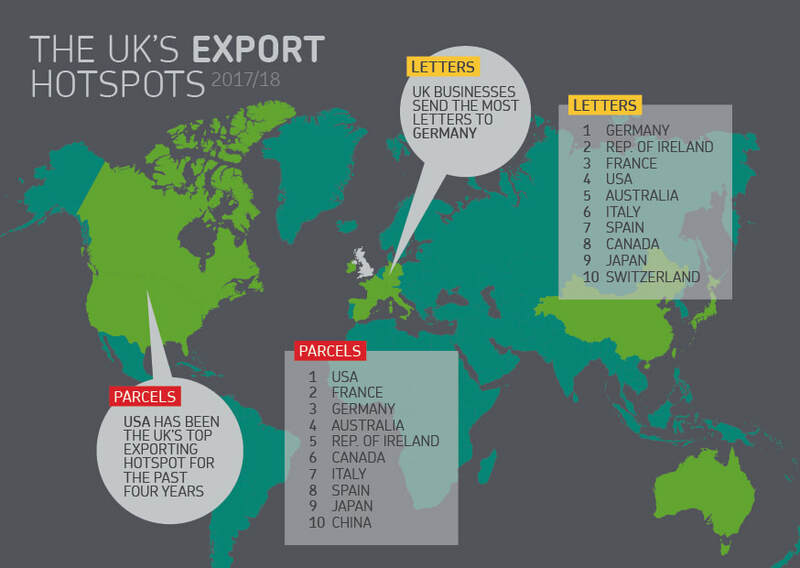 When it comes to letters, UK businesses send the most to Germany, Ireland and France. USA and Australia also feature in the top five. Ireland has been in the top two for the last four years. The top five countries that the UK imports goods from remains unchanged over the last three years. China leads the way followed by Germany, USA, Netherlands and Switzerland. For letters, the most inbound have come from USA for the last three years. France and Germany are also in the top three destinations.